We just recently put the final touches on this incredible, heirloom of a farm table and matching bench for a wonderful customer. But even more when she sent us these great pictures of them in situ, rehomed. The table itself was a massive undertaking, as it's eight feet long and built with only our best saw-marked, distressed, antique old growth heart pine, salvaged from many buildings in the historic and Victorian districts of Savannah, including the old Ice Factory on Victory Dr., now one of our favorite restaurants, The Florence. It features our traditional skirt from Victorian painted bead-board porchwood, and tapered legs fashioned from salvaged, historic Savannah structural beams. This table will certainly last many more generations. 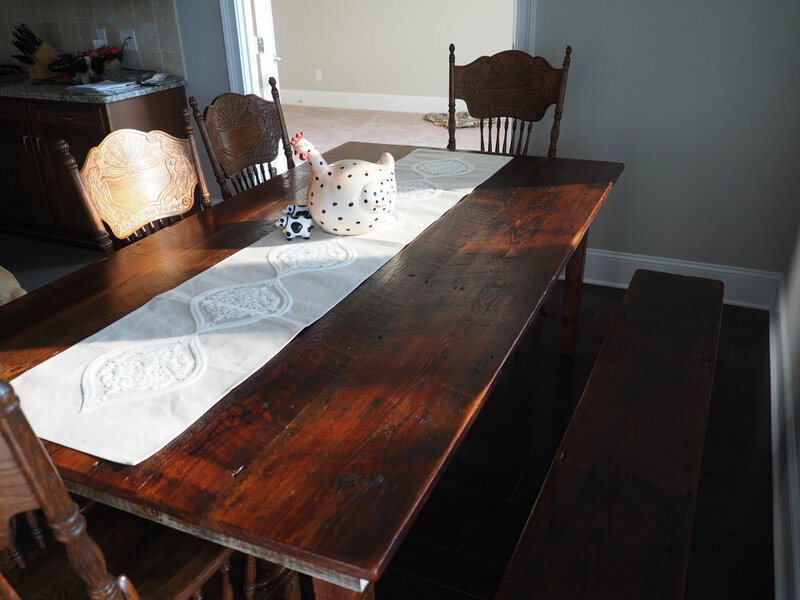 If you would to adorn your home, and add to your family history with one of these heirloom, one-of-it's-kind, farm tables and/or benches, please contact us.